There are a number of speed skating competitions during the year. As a Club, we participate in our own Fun Meets, regional Ability meets, and championship Age Class events. Skaters and their own families determine which meets they wish to participate in, given their own schedule preferences and competitive goals, with guidance from their coaches. Fun Meets: We generally run two Fun Meets each year, one in December and one in March. All skaters are encouraged to participate in these mini meets. The emphasis in these meets is on having fun. They are run in the same manner as other meets, but there are both regular races and fun races. Relays are also usually part of the meet. These meets give the skaters are chance to test their speed in a relaxed atmosphere. Ability Meets: Ability Meets (sometimes called “All Points Meets”) are the most common meets in Atlantic Canada. In these meets, skaters’ best times are submitted in advance and the skaters are then ranked in mixed-gender divisions based on their times, regardless of age. This ensures that all skaters have fun and competitive races. In general, the meets are spaced over two days and the skaters will participate in 7 to 11 races over 4 to 5 distances with heats and finals. The distances skated depend on the speed of the skaters in the division. The focus in Ability Meets is on putting in your best effort and improving your own performance (e.g. using good technique, skating faster times, moving up in a Division, making a good pass). To a certain extent, the ability of a skater to finish in the medals in their division is dependent on the “luck of the draw” when the divisions are made up. A skater who finishes at the bottom of a division may easily have been the skater who would have won the Division below if the dividing line for divisions was only slightly different. Therefore, the focus is on the skater’s own performance and not on whether they win a medal. Of course, everyone likes to win and the best way for a skater to win is by skating his or her best. Age Class Meets: Currently, the Canada East Short Track Championship is the only age class meet typically attended by PEI skaters. In age class meets, skaters are placed in divisions based on age and gender. Canada East is open to skaters from ages 12 to 15 (boys) and 11 to 14 (girls). To participate in Canada East, PEI skaters must meet certain criteria and earn a spot on Team PEI based on their competitive times throughout the season. Please see the Team and Selection Criteria page for more information. There are some variations from meet to meet, but generally skaters will skate a heat and a final race for all but their final distance, in which case a “super final” may be held, without a heat in that distance. All skaters participate in the finals and ribbons are awarded to all skaters for individual finals. The heats for a distance are run first. For example, if there are fifteen skaters in a division, there would generally be three heats of five skaters. The skaters are seeded into the heats based on previous times so that the fastest three skaters are in separate heats and the rest of the skaters are also equally distributed based on times. Depending on the meet and the number of skaters in each division, placement of skaters in the finals are based either on placings, times, or a combination of the above. If you are unsure, you should check with your coach. After the heats, the skaters are then placed in the A (top), B, or C finals. The winner of the A final is the winner of that distance. With our fifteen skaters, there would be five skaters in Final A. The winner of the Final B will receive a first place ribbon for winning the Final, but is actually placed 6th over-all. It continues down the line so that the winner Final C is actually 11th over-all. Points are awarded based on over-all placing for each distance. The top 3 male and female in each division then receive the over-all Gold, Silver, or Bronze. Except for national championship level meets, medals are not usually given for each distance. Skaters are responsible for watching the race numbers to know when their race is coming up. Approximately 45 minutes before the race, the skater should warm-up by jogging and stretching as they have been taught by their coach. Generally, our skaters warm up in groups. The skaters should then go to the dressing room and get into all their equipment approximately 20-30 minutes before the expected start of their race. They must leave themselves adequate time to check and put on all their equipment. Skaters then go to the “bullpen”, usually around 15 minutes before their expected race start. The bullpen is the designated gathering area near the point of entry onto the ice. A meet official here will call out the names and arrange skaters into their heats (on chairs set out for them to sit on). Skaters are then moved on to a bench (usually the players bench) just before they go on the ice. Please be on time. Races are not held for late skaters. After the race, the skater must promptly leave the ice, remove and dry their equipment, check skates for any problems, then return their equipment to their bag or sharpen it as required. Regarding the rules, in general, common sense prevails. That is, given the number of skaters on a small ice surface, the objective of all the rules is to be as fair as possible for everyone and as safe as possible for everyone. That means: no interference with other skaters, complete the distance assigned, no false starts, no dangerous moves, etc. If you have additional questions regarding the rules, please consult with your coaches. 1. The distances skated are determined by the level of the skaters in a division. The track size varies, with an 85 metre track used for our youngest skaters, a 100m track for most skaters and a 111m track used for the oldest and fastest skaters. The start line of the race may change for races that have a half-lap in them (eg 500 M is 4.5 laps on the 111m track), but the finish will always be in the same place (the side with the single red line). The cones marking the track are periodically moved to protect the ice and so the start line may also move to match the cones to keep the distances skated constant. 2. Assigned helmet covers must be worn for all races, showing skaters’ numbers on both sides of the helmet. 3. All protective gear must be on and bare skin covered or a skater will be disqualified or barred from skating in the race. Skates must be tied and all bolts tight. Equipment must not be removed until the skater has left the ice. 4. Two false starts and a skater is “penalized” (disqualified). The skaters first line up behind the blue line at the start of a race. They then move to the start line on the command “Go to the Start”. Once at the start line, they remain relaxed in a standing position until the starter says “Ready”. After a pause to allow skaters to take their start position and become still, the starter fires a gun or sounds a tone to start the race. If there is a false start, the starter either fires the gun or sounds a tone a second time or blows a whistle. Starting in 2014-15, the first false start in a race is charged against the entire field. This means that if any skater commits another false start in that race, even if they did not commit the first false start, the skater will be penalized and removed from the race. 5. If a skater is knocked down by another skater at the start (before the first corner apex block), the starter may call the start back. However, if a skater falls on his or her own and was not interfered with by another skater, the race will normally continue. 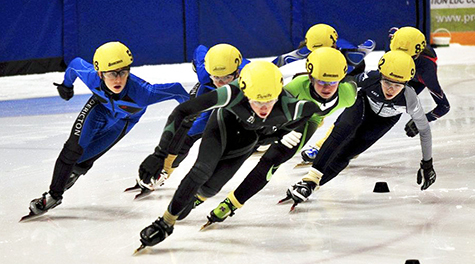 If a falling skater interferes with another skater off the start, the race is generally called back. This is a judgement call by the starter and it should never be assumed that a race will be called back. 6. Skaters are not allowed to shoot a leg forward to try and get a skate across the finish line in front of another skater. This action is called “kicking out” and will result in a penalty. 7. A skater may knock a cone without being disqualified but if a skater skates inside the cones marking the curve to try and shorten the track, they will be disqualified. There are track stewards on the ice surface who replace displaced cones. 8. Skaters are not allowed to interfere with other skaters: no pushing, no bumping a skater in front of them (e.g. by cutting inside as they enter a corner). This is referred to as “impeding”. 9. If a skater falls, it is their responsibility to make sure they don’t interfere with another skater when getting up and starting to skate again. This means that they have to check behind them for other skaters before getting up or back on the track. Skaters who have fallen and are effectively out of the running will usually keep to the outside of the track. 10. Any unsportsmanlike behaviour may also result in disqualification. This may include, but is not limited to, swearing or insulting other competitors or officials, punching mats after a fall, or inappropriate celebration on crossing the finish line. 11. If a skater falls on their own or is taken down in an accidental fashion by another skater, it is simply considered bad luck. However, if a skaters is knocked down or knocked off course as a result of an infraction by another skater, that skater may be “advanced” from a heat to a higher final by the referee. This will only happen if the referee has determined that the skater was in a position to earn a position into that higher final when the infraction occurred. Before most meets, we have a team meeting (or meetings) and ask our skaters to set goals. For the Atlantic Cup, these team meetings are usually held at the Eastlink Centre during the week before the Atlantic Cup. During out-of-province meets, the team meetings are normally held on the Friday night before the meet in the team hotel. The meeting is a chance for the coaches to talk to the skaters about goals, rest and nutrition and for skates to be checked. Goals for each skater may include time goals and/or other technical and tactical goals (strong basic position, improved arm swing, better knee bend, setting up a good pass). This helps the skaters focus on skating their best at the meet and allows them to progress without always being the first across the line. All skaters are reminded that junk food is not to be eaten during a meet — no candy, no chips, no soft drinks, pre-sugared cereals, etc. Please eat healthy food. Of course, you should do this at all times and not just during the meet, but avoiding “sugar highs” is particularly important during a meet. Good food is often not available at the rinks and there is often limited time to leave the rink to get food. Many skaters bring a cooler of healthy foods with them for lunch and post-race snacks. All skaters should also bring lots of water to drink. Dehydration can dramatically decrease athletic performance. The dressing rooms are primarily for the skaters and the coaches. With a lot of skaters, there is often not much room. Also, it is a good place for the skaters to meet and interact with other skaters and it is the place where the coaches can talk to the skaters before and after the races. Parents in the dressing room tend to interfere with the interaction between coaches and skaters. Younger skaters will obviously need help with their equipment prior to the race and perhaps after the race as well. However, please limit assistance in the dressing room to one parent only (no siblings please) and only to the time needed to dress the skater. In general, if your child is over 12 years old, parents should not be in the dressing room. In the dressing room, skaters should keep all their belongings together between races, preferably in their bag so that they know where to find their equipment when it comes time to get ready for the races. Parents, skaters, and coaches must respect the officials at all times. Please see the section on rules for a general overview of speed skating rules. Some of the calls made by officials are “judgement calls”. Please do not openly criticize the officials. If the Coaches feel a significant error has been made (i.e. the wrong skater penalized by mistake), they will raise the issue with the referee. While the Coaches may ask for clarification so that they may properly explain the call to the skater, they will generally not argue judgement calls with the officials. The assistance of parents of the younger skaters (under twelve) is requested in ensuring that your child is ready for their race. Please cheer loudly for all our skaters and congratulate all children, but especially your own, for their efforts. Even in a race that doesn’t go well, there is always something good to encourage. Leave all coaching and “helpful tips” to the Coaching staff. They have a good understanding of what to expect from kids at each age and ability level. If a skater falls or has an otherwise bad race, please do not rush down to the dressing room to console the skater. Let the coaching staff talk to the skaters. All skaters, regardless of their level, need to learn to handle competition on their own. Skaters will be disqualified or disallowed from racing for not having all required protective equipment on for each race. Please check all your equipment prior to the meet and before every race. Each season, many skaters miss races due to forgotten neck guards, glasses. gloves or ankle guards. After finishing a race, skaters must not to remove any of their protective gear until they are off the ice. Coaches, Equipment Managers and experienced parents will often help newer skaters and their parents with keeping their skates sharp and in good working order. However, it should be remembered that there can be many skaters at a meet and the sooner a skater and/or the parent becomes responsible for their own skates, the better. Club sharpening jigs are available to be borrowed for those who have not yet purchased their own. Skates should be checked at the pre-race meeting and every couple of races. If a skater thinks they have damaged their blades, they should be checked right away. Skaters should keep their hard guards on while walking on their skates and younger skaters should be reminded to avoid kicking the benches and boards while waiting for their race to start. It is also good to minimize the amount of walking in hard guards. It is common to see senior skaters putting their skates on in the bullpen area to save their blades from extra walking. Water is put on the track to keep the ice from getting damaged by the skaters. This means that when a skater falls, they usually get wet. It is important to make sure that a skater has at least one and preferably two changes of clothes suitable for skating in. A change of gloves is also useful, but make sure they meet the requirements for competing. Many skaters will bring along a hair dryer to dry out their clothing if needed. In addition to appropriate outdoor footwear, a pair of sneakers for warming up inside is also needed, especially for older skaters.